If you’re a fan of Tedium in digital form, you should know that we’re going to create a physical form. But not just any physical form. Zine form. 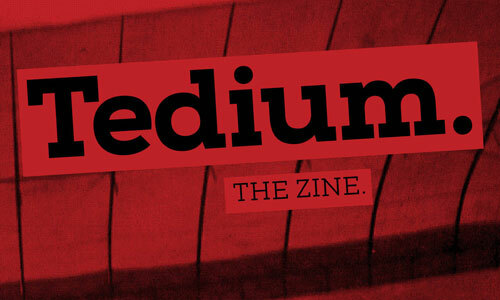 A while back, my friend Simon Owens wrote this piece in which he compared email newsletters to zines, and used good old Tedium as an example of the form. It makes sense to a degree—there’s a DIY ethos that comes with any self-publishing project, and with newsletters as with zines, the weirder, the better. That thought stuck with me and kind of got into my head as a thought monster, and as I was thinking about ways to do something fresh with the Tedium concept, the zine struck me as the perfect kind of vessel to do something a little different, while still in the spirit of this thing I’m already writing. So I’d like to announce that Tedium will be releasing a limited-edition zine that will only be produced in numbered editions for everyone in my $5 Patreon tiers and higher. Anyone in the U.S. who wants one should sign up, because I’m only going to be doing a single run, which I'll send out sometime in October. If you miss it, you miss it. What’s gonna be in it? A fully reported and researched story that’s going to be on a topic that’s close to Tedium’s heart, though I have no plans to spoil the surprise. You will not know what's in it until you get it. Just like how it works in your email inbox. It’s going to be simply designed, on gloriously standard paper with limited color, stapled together with the majestic power of the human hand. If you’re a fan of Tedium, you’re going to dig this. Promise. Anyone who’s interested, please sign up on Patreon! More info coming soon!